Snapshots of the protein chaperonin GroEL in its transition pathway, evolving from open (upper left) to closed form (lower right). The color scheme was inspired by Wassily Kandinsky and his artwork “Squares and Concentric Rings”. 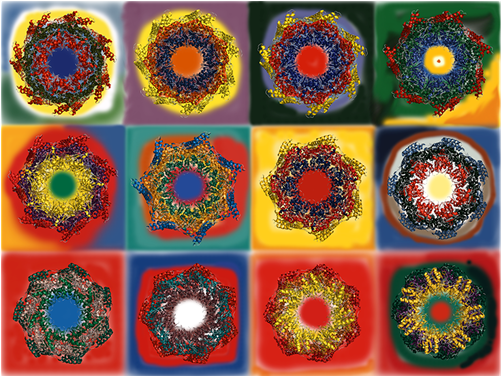 Most proteins are biomolecular machines. They perform their function by undergoing changes between different structures. Understanding the mechanism of transition between these structures is of major importance to design methods for controlling such transitions, and thereby modulating protein function. However, exploring the transition between conformations is difficult, both experimentally and computationally, due to the transient nature of the intermediate, high energy conformers crossed over as the molecule undergoes structural changes. In many cases, only the two ending structures are known from experiments. Furthermore, the passage between the two end points does not necessarily involve a single pathway, but multiple pathways in the multidimensional energy landscape associated with the macromolecular structures. To bridge between structure and function, a molecular understanding of the most probable transition pathways between the two end structures is required. While there are many computational methods for exploring the transitions of small proteins, the task of exploring the transition pathways becomes prohibitively expensive in the case of supramolecular systems. Coarse-grained models that lend themselves to analytical solutions appear to be the only possible means of approaching such cases. Motivated by the utility of elastic network models for describing the collective dynamics of biomolecular systems, and by the growing theoretical and experimental evidence in support of the intrinsic accessibility of functional substates, we introduce a new method, adaptive anisotropic network model (aANM) for exploring functional transitions. As described by aANM, a series of intermediate conformations along the transition pathways between the initial and final conformations were generated by successive deformations of both end structures that were iteratively updated. The directions of deformations were determined by implementing the deformations along the directions of dominant ANM modes accessible to the intermediate states. The recruitment of the particular subsets of modes results from a tradeoff between minimizing the path length and selecting the direction of the lowest increase in internal energy. The bacterial chaperonin GroEL is a supramolecular machine that has been broadly studied in recent years using both experimental and theoretical or computational methods. Yet, a structure-based analysis of the transition of the intact chaperonin between its functional forms has been held back by the large size of the chaperonin. The aANM method is proposed as a first approximation toward approaching this challenging task. The application of aANM to GroEL, not only elucidated the highly probable pathways and the hierarchic contribution of modes to achieve the transition; but also provided us with biologically significant information on critical interactions and sequence of events occurring during the chaperonin machinery and key contacts that make and break at the transition. On a practical side, the major utility of the method lies in its application to the transitions of supramolecular systems beyond the range of exploration of other computational methods. The computing time in the present method is several orders of magnitude shorter than that required in regular molecular dynamics or Brownian dynamics simulations. Related publication: Zheng Yang, Peter Májek, and Ivet Bahar (2009) Allosteric Transitions of Supramolecular Systems Explored by Network Models: Application to Chaperonin GroEL. PLoS Comput Biol 5(4): e1000360. Download the aANM source codes and executable files.